As the school year draws rapidly to a close (seriously, where did it go?) I’ve been reflecting on my first year as a school outreach librarian. I can’t tell you how invigorating it has been to use different skills and get to try new things with a wide variety of audiences. One of my favorite programs this year was all of the booktalks I did for middle schoolers (6th-8th grade) and teachers. 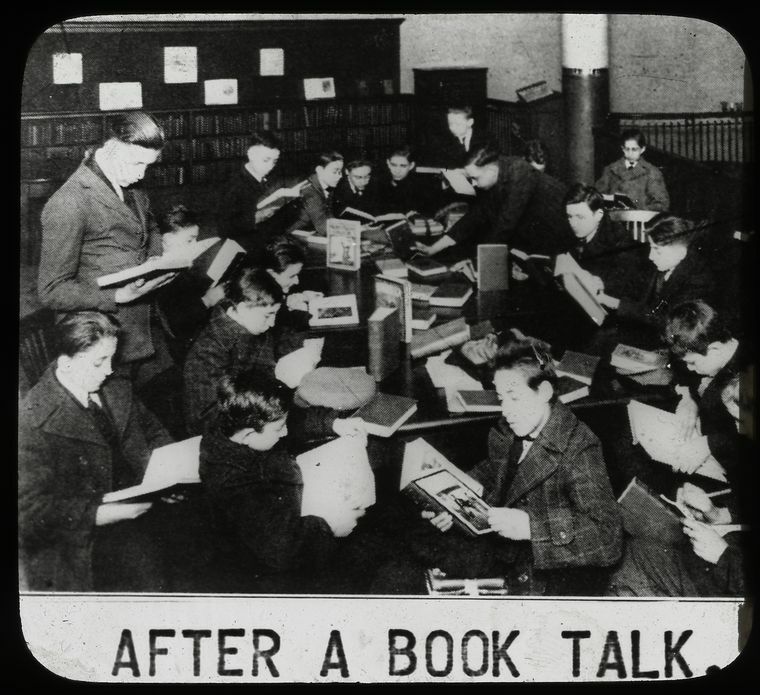 In my previous six years as a librarian, I had done very few book talks. It was something I really wanted to do, but it just never happened in previous positions. I was extremely lucky that I started out this school year being invited to book talk first to two groups of teachers, one elementary and one middle school. After getting to see me and my colleague book talk, teachers had a sense of who I was, how I behaved, and liked me enough to want to have me get up in front of their students. This was a great break for me, and once one class had me and my coworker in, all of the rest of them wanted us, too. 1) Variety. With two readers sharing books, the kids will get a wider variety than from one person alone. While I am very careful to select a variety of books, there are certain genres and topics I just can’t muster much enthusiasm for. I can fake it, sure, but why do that when a coworker is just nuts about the books I’m lukewarm about? While I’m pretty good at selling any book, kids can tell the difference between my genuine enthusiasm and the enthusiasm I put on for their sake. 2) Attachment Librarianing. This is something I carried over from my preschool teaching days, and I think it really applies to librarianship. Kids and teens are all unique, and not every personality is going to have a great fit with every kid or teen out there. For example, I quickly bond with shy, nerdy, awkward kids and teens (I try to find the Whovians in every middle school class as fast as I can). Other kids like me just fine, and I can and love to help everyone, but the geeky kids are more likely to seek me out and will get better recommendations from me, just because we’re so simpatico. With more staff available, more kids are likely to find the librarian whose style and personality speaks to them, which equals better service. For me, booktalks are a lot like storytimes for older kids. While I don’t reveal endings or major plot points when I book talk, I do tell a story to get kids invested and interested. A lot of times I will use the theme of a novel or a hook from a nonfiction title to riff for a while. Just call me the wholesome Richard Pryor of librarianship. For example, when I booktalk Fourmile by Watt Key, I spend a lot of time talking with kids about PTSD, the stigma of mental illness in our culture, how we treat our soldiers, and why so many books for kids feature dead dogs (seriously!). When I talk about Almost Astronauts, I tell them the anecdote about Jerrie Cobb shattering all isolation booth records (NINE HOURS AND FORTY MINUTES Y’ALL), yet never getting the chance to be an astronaut. From there, I talk a bit about how women are seen in our culture and how we are treated. My style is a little unconventional, I suppose, but it works for me, and it works for many of the kids I booktalk to. And that’s the important thing, I think–is to find your own personal style, your voice. That’s what will make your book talks exciting and get the kids interested in reading the books you’re pushing. And what books do I push? It depends. If a teacher is working on a genre study, I’ll bring titles in that genre. Often I like to do a mixture of fiction and nonfiction, new books and backlist. I try to have books at a wide variety of reading levels with a variety of appeal factors. Most of all, I strive to bring books that I’ve read completely and have a component that I am super, super excited about. Even if I didn’t personally love the book, if there’s a crazy character or fascinating setting that I can see kids being interested in, I’ll definitely book talk that sucker. So that’s just a little bit about my new favorite professional responsibility. What about you–do you book talk? What’s your style? Any favorite titles?